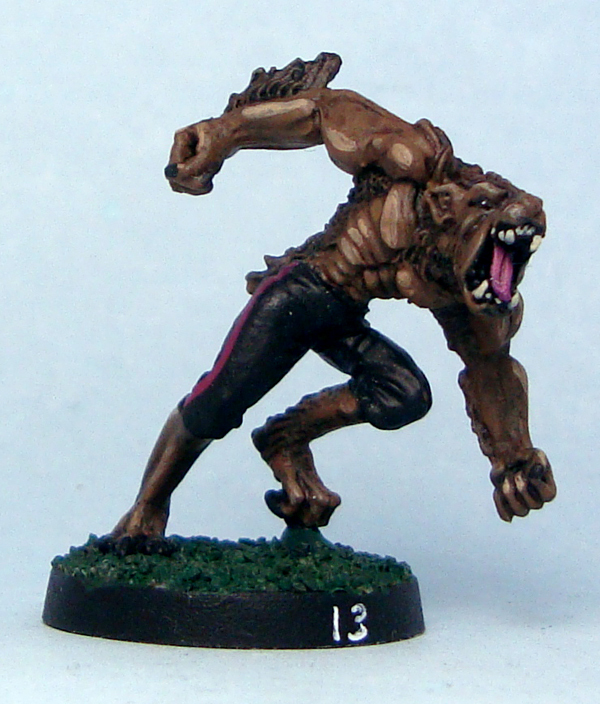 For me, this 2012 season of Blood Bowl is over. After playing the 13 league games and finishing third in our division of five, I made it to the playoffs – somewhat to my surprise. Less surprisingly the first playoff round proved to be my undoing, with Vikings IF sending the Drakwald Ravens packing, as well of killing one of my veteran ghouls, Karl Eye-Popper, and putting Ludwig Wightenstein in a wheelchair with a thoroughly destroyed hip. The poor wight suffered a “smashed hip” result in his first game of the season, never amounted to anything during the games he played, and received a second “smashed hip” in the Ravens’ last game. Poor Ludwig! With my gaming part done, it’s time to look back upon the season. All in all I was more than pleased. My last season of Blood Bowl saw my orc team the Naughty Grinders finish with a 2-2-6 (wins-draws-losses) record from ten games, whereas this season the Drakwald Ravens managed a 4-5-5 record from a total of 14 games. So, fewer defeats, twice the victories and more than twice the draws. Can’t really be disappointed! The Ravens steadily upped their game throughout the season, and before the playoffs actually had a four match long undefeated streak with two wins and two ties. The only thing I wasn’t happy about was my team’s seeming inability for violence. While a virtue outside the Blood Bowl field, 11 inflicted casualties in 14 matches is appalling, especially compared to the league (sans Ravens) average of over 21. Out of those 11 casualties no less than five were executed (tee-hee) by my number one flesh golem, Max Hurtheimer. The more I play Blood Bowl, the more convinced I am, that this is the best game GW has put on the market. Blood Bowl combines luck and skill wonderfully – while sometimes horrible luck can bring you down no matter how good you are, most of the time the more skilled player will have the upper hand. It is an important skill in itself to minimize the role of luck, in other words the number of dice rolls you make. While I’m slowly learning the game, the more experienced players often seem to be a move or two ahead of me, no matter what I do. This sprang from a few of our friends who were watching the game and celebrated the death of the werewolf by chanting the now-legendary “hukasta rukkaset!” which is Finnish for “make the wolf into mittens!” They were interpreted as being dwarven fans. In this item the dwarf fans accused of racism were shocked and appalled. They claimed the chanting was a joke, nothing more. This was a parallel to several then-current events where Finnish politicians made racist comments in public, and then claimed that they had been ironic or joking. This was an adaptation of an actual news item dealing with genetic problems caused by overbreeding in dogs. Drug scandal in the league! Warpstone overdose to blame for Anti-Christian Wolff’s death? In which a Norse team’s werewolf comments that the combination of overbreeding and warpstone use is a deadly one, and that it is a public secret in the werewolf community. 2 in 1 furry mittens from Stockkleinemann sale! A parody of then-current sale campaign of the Finnish department store Stockmann. Made by dwarven artisans, the luxurious leather mittens could be turned into furry ones by the touch of Moonstone™. And so on. This is what makes our Blood Bowl that extra bit special. It’s very similar to the idea of Warpg’s I’ve often talked about. What’s next? Well, there are still games to be played in this season’s playoffs, and then at some point it’s time for the 2013 season. I’ve already bought a new team from Impact Miniatures, the Middle Kingdom humans who are done in a classic Greek/Spartan style. I’ll have a lot of fun coming up with a back story for those guys. With all this, I’m happy to report that in our group Blood Bowl is alive and well! It’s time to present to you the coach of the Drakwald Ravens, Nekromantti Ruuminen. As is apparent to my Finnish readers, he is based on Antti Muurinen, the former head coach of the Finnish national football team. I named my coach in a spot of Finnish punning, and his Finnish name translates as “the necromancer Corpsy”. That open smile, that wonderful moustache! Against an opponent like that, a tie can be seen as a victory, as can a narrow loss. Even a crushing loss, such as today, should be seen as a positive learning experience, and as such, a victory. Coming up with a suitable model to represent him on the sidelines was a grueling task. You wouldn’t think so, but it was. Out of sheer curiosity, how many smiling human miniatures do you own? Check it out, you might come away empty-handed. I did, at least. I spent a good while browsing through different manufacturers’ catalogues, thought about sculpting my own, asked around on forums and was left with no great solution to the problem. The few smiling miniatures were stylistically unsuitable for my uses. Finally I happened to notice a model that was sitting on my desk. It was one that I received from fellow blogger Sho3box as part of one of our trades. The model was that of a man dressed for a wedding, about to pull a gun from inside his jacket. Now, it’s a cool miniature and there’s even a matching bride, but for the life of me I couldn’t figure out how I could best use him. A bit later I had my coach. I used ProCreate putty to add the all-important moustache and to turn the mini’s fairly gruff expression into a smile. I sculpted the pistol grip he was holding into a handkerchief, and that’s pretty much it. I did a very quick job on him, and painted his eyes larger and more cartoony than usual. He came out looking like a kindly magician from a kids’ movie. Not my smoothest or neatest paintjob at any rate, but still: great success! The song, a parody of this one (go ahead, treat yourself to some quality Finnish pop music – English lyrics included! ), has become something of a running joke in our Blood Bowl games. Quite deservedly so. Our Blood Bowl league has taken off magnificently. So far we’ve had a grand total of 19 [sic] games since the start of the season in January, and the fourth round of matches is almost finished. Social events. This is really what the games are turning into. More and more people will flock to see games played by others, offering their commentary and interpretation of game events, having a few beers and simply having a good time. With people working, studying, getting children and things like that, quality time like this tends to be hard to come by in the same quantities as five to ten years before. Narratives. 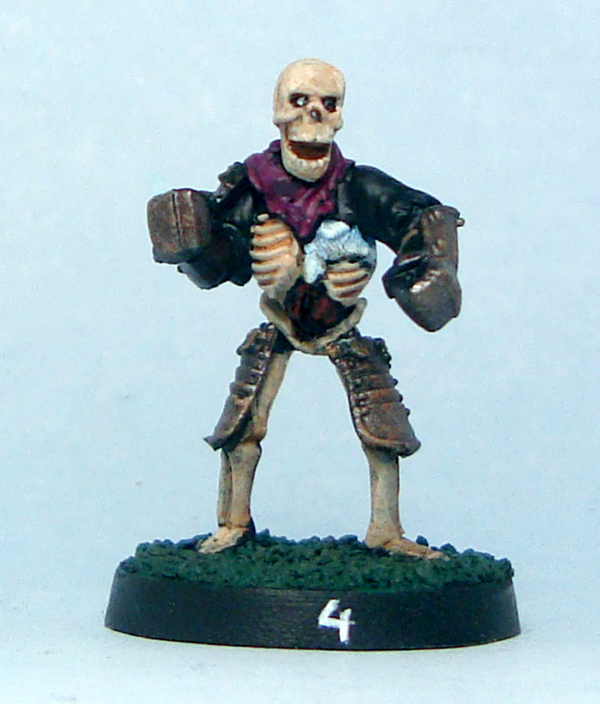 We’ve long had an internet discussion forum, which is nowadays almost completely devoted to all things Blood Bowl. One of the best aspects are the narratives building around the league, its coaches and its players. From the bitter hometown rivalry between the wealthy dwarf team of Blackpit Arsenal and their working-class opposition, the chaos dwarves of Blackpit Chaotic to the naughty nun team of the Marienburg Spankers (with their trademark pass action declaration “Nun shall pass!”), the narratives, game reports and the like are often hilarious stuff. All the ten players in our league are avid role-players, and as such no strangers to happily making up intricate stories about simple events. The narratives also form something of a pressure valve, allowing frustratingly bad luck with the dice to be explained away as bribed referees and the like. Excitement. 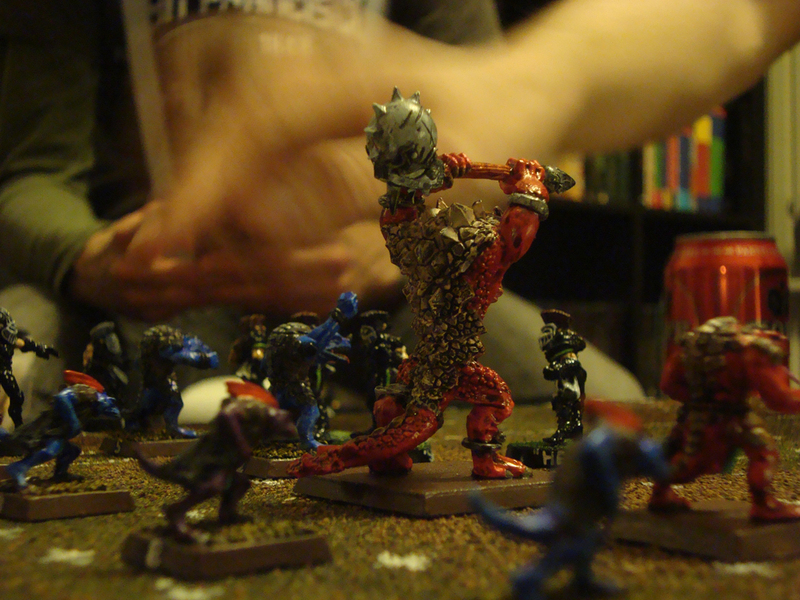 Blood Bowl is an excellent game – I think the best one Games Workshop has ever created. It strikes a good balance between skill and luck. The games tend to be really exciting, with adrenaline levels spiking and palms sweating as a mere 2+ roll stands between victory and defeat. Today’s game was a great example, with the Lustrian Swamp Shamans squeezing a 3-3 tie against the Sea Elf Seahawks with a daring passing play – only succeeding on a roll of 6. These things combine to make our Blood Bowl league so much more than just a bunch of games played with miniatures. I can’t tell what it exactly is, but I can honestly say that it’s been a long while since I’ve enjoyed miniature gaming this much. Did you know, that a flock of ravens is actually called an “unkindness”? Really! Read a column on the subject here. Anyway, this curious piece of linguistics brings me to the main point of this post – namely my completed Blood Bowl team. There are a few extra models, and I have one werewolf pending a repaint. 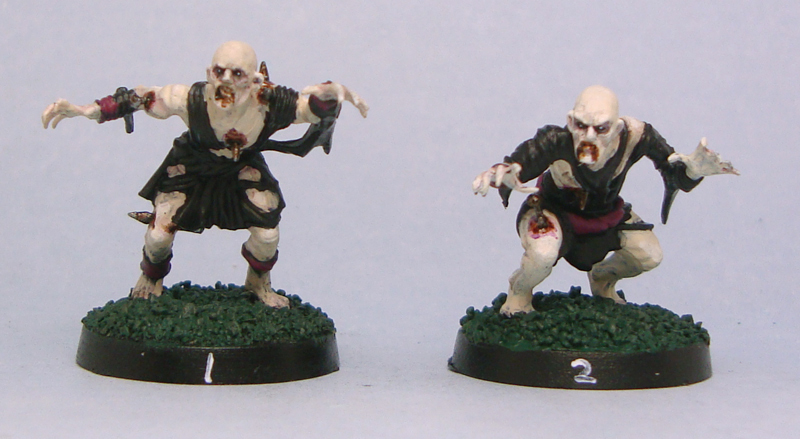 Other than that, here are the Drakwald Ravens in their gothic glory. Arthur Schopenhowler the werewolf. I simply love this model from West Wind, see the review here. Jürgen Habermassacre the flesh golem. The model’s a tank zombie from the FU-UK sculpting competition a few years back. One never really knows who one’s enemy is. Georg Henrik von Wight the..wight. The model is a custom build from GW plastic parts. If one is satisfied with things, one doesn’t complain about the downsides that exist, either. There you go! An actual, completed project. 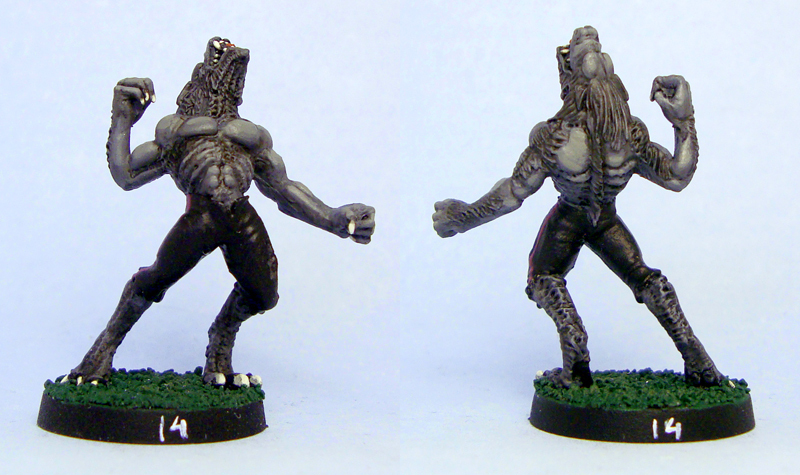 Should I need another werewolf, I’ll simply give the pants and base of a previously painted West Wind critter a quick repaint. I’ve been painting like crazy lately. 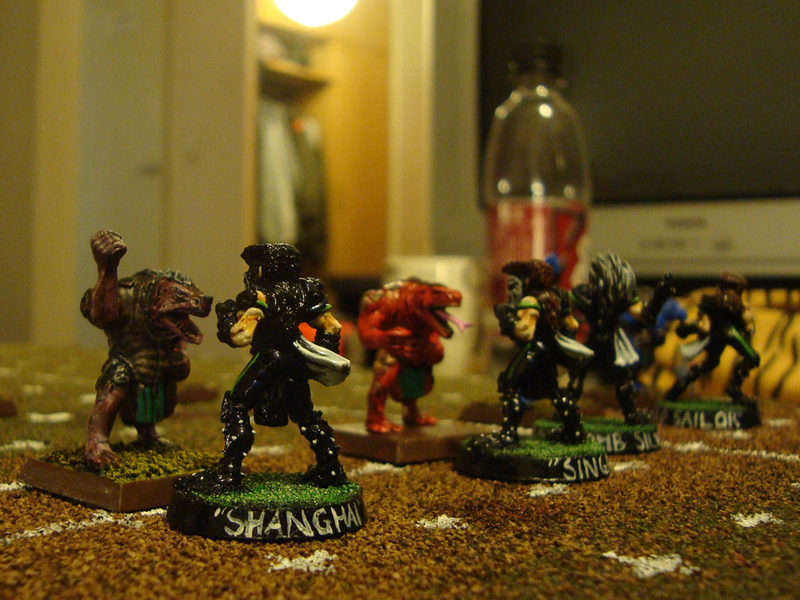 Our 2012 Blood Bowl league has kicked off, and the Drakwald Ravens have already faced off against the Lustrian Swamp Shamans. I managed to field an almost fully painted team, but still have two half-finished models to go. 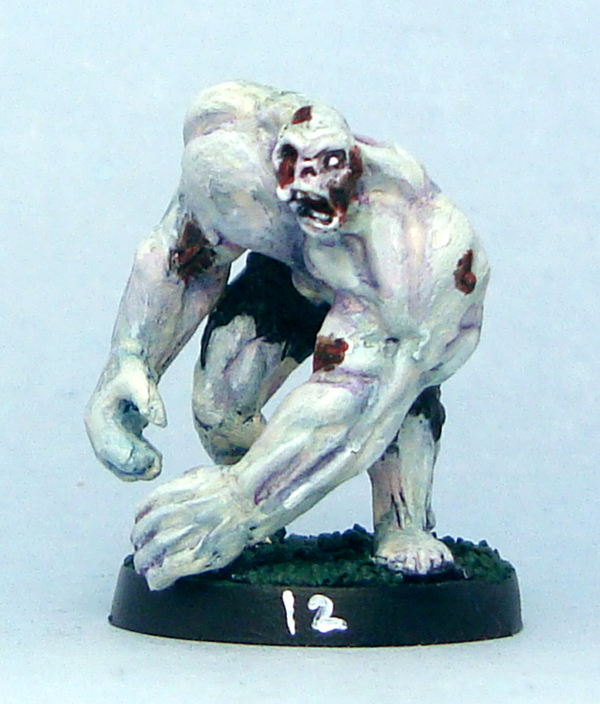 The main step my painted team took forward was me painting six zombies in pretty much two evenings. I pretty much used my basic zombie recipe, and I think it worked fine here. As usual, flat colours only for the “uniforms”. So here we go, new additions to the lineup: Martin Eyedigger, Friedrich Dark-Engels, Immortal Kant, Gore Marx, Gut-lob Frege and Hurt Gödel. Of these guys poor Marx and Gödel never made it past their first match and Frege is yet to make an appearance. While we’re talking about the match, man…it was for me Blood Bowl at its worst. Or no, not really, so let me rephrase that. It was a good game of Blood Bowl, with my luck at its worst. Let me just put it this way: the most amazing moment of the match was poor Ludwig Wightenstein missing a trivial block against a weaker opponent, going down on a roll of double skulls, re-rolling those into another set of double skulls and receiving a shattered hip permanent injury. I should at this point note that the probability of such a chain of events is considerably less than 1/100 000. Needless to say, my opponent Joonas (of Dusty Gamer) had a field day. To use a quaint expression, the lizards tore me a new one. A whole bunch of new ones, actually. Oh well. At least my team is pretty. In a ghoulish, dead sort of way. First of all, pardon for the awful (if there is another kind) pun in the title. 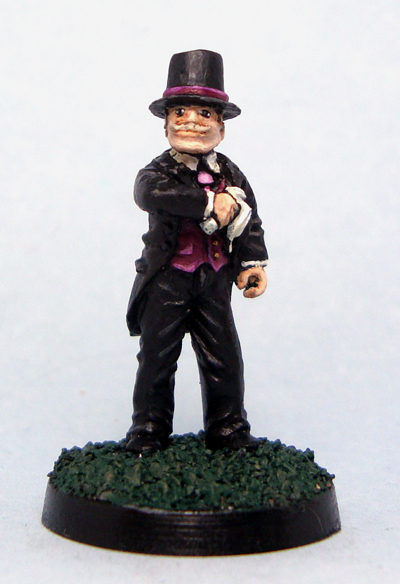 It was my rather quaint way of letting you know that I’ve completed two new models for the Ravens. Let me present to you… Karl Eye-Popper and Oswald Strangler! 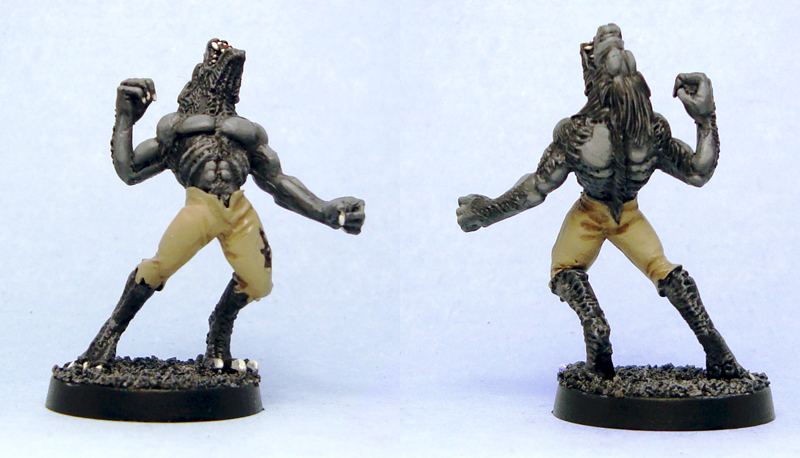 Both are ghouls from Mantic (reviewed here), and lovely miniatures to paint. What made them even easier to paint is the fact that I made the conscious decision to leave the uniform colours without shading to convey something of a game piece vibe as opposed to something more realistic. So, plain black and purple it was. To counterbalance this, I did some extra work on the skin and the self-inflicted wounds, trying to make the former deathly pale and dirty and the latter nasty and infected. I’d love to hear your comments on whether it worked or not. Here are my new players, along with their thoughts on their existence. This is our purpose: to make as meaningful as possible this life that has been bestowed upon us; to live in such a way that we may be proud of ourselves; to act in such a way that some part of us lives on. You are currently browsing the archives for the Blood Bowl category.